What would come to mind if you heard the words “senior living food?” Would you picture a delicious meal or something, well, less than appealing? Not so long ago meals at senior living communities were created with several goals in mind. A lot of the food was rather bland so that all residents could eat the same thing. Much of it was overcooked because the softer it was, the more residents that could eat it. And of course, another important goal was to keep the cost down. But seniors – and their families — just weren’t going to take it anymore! Many people choose to move to a senior living community to downsize and cut back on household chores. It doesn’t mean they’ve lost their taste buds. It doesn’t mean they don’t appreciate a good meal – and even the pleasures of a fine dining experience. And senior living communities are starting to recognize that. Suddenly, senior communities are competing with restaurants and country clubs to lure top culinary school grads and experienced chefs to their kitchens. The goals now are quite different. The focus is on healthy yet tasty meals that make residents feel like they’re in a restaurant – not a hospital. At the Discovery Village Senior Living Community in Fort Myers, Florida (and coming soon to Naples and Bradenton) food is more than just sustenance. Sensations Dining, they call it. And for good reason. The meal experience lives up to its name three times a day. Anyone who’s ever read a magazine or listened to the news knows that food plays a major role in maintaining our good health. And that’s not an exaggeration — doctors will agree. But what chefs have known for a long time is now filtering down to senior living administrators – food also contributes greatly to our mental health. If your day is centered around eating food that’s tasteless, colorless and sometimes even nameless, what kind of quality of life is that? So senior living chefs around the country have taken to the markets — and back to the kitchen – with foods that are not only good for you, but just plain good. At Discovery Village, meals are as much an activity as BINGO or Wii bowling! Sensations may as well be called Sense–ations because the dining experience appeals to all of your senses. Just like a 4-star restaurant, meals are served in a dining room set with table linens and china. A lot of thought is put into choosing and preparing the food. Healthy? Check! Tasty? Check! Is there variety? Yup, that too. 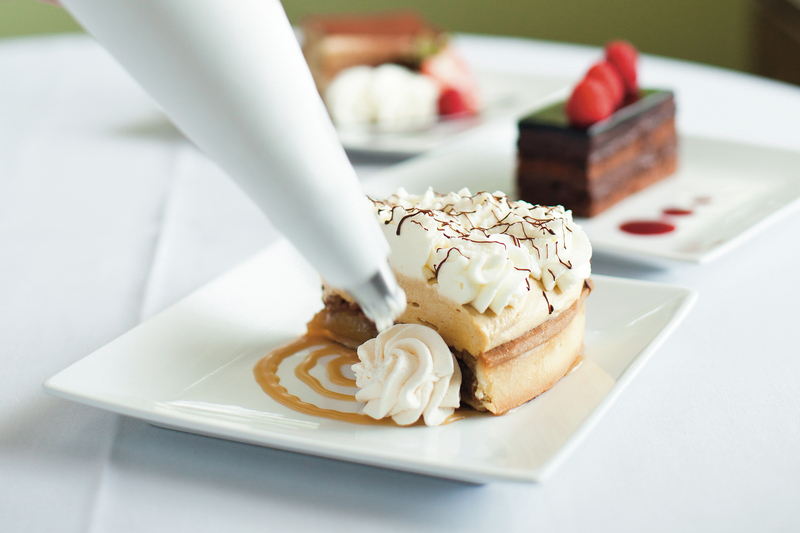 From appetizers to entrees and on to dessert, it’s not just food – it’s an experience. It’s just like eating out, only you don’t have to leave the property. There’s a wait staff and a menu. Yup – you get to choose what you want to eat! And don’t tell anyone, but it doesn’t have to be totally healthy – amidst the Greek salad and the roasted beets, you’ll also find a good old hot dog and onion rings if that’s more your style every now and then! And speaking of activities – you’ll find food taking center stage at theme parties and holiday events! Yum. Just as senior living communities themselves have entered the modern era, so has mealtime. Residents have different schedules and different tastes and many senior living communities now cater to that too, offering residents choices. In fact, resident committees often work with chefs or onsite nutritional staff to come up with new menu options at many places. And resident input results in not only good food, but ownership of the choices served, which makes for happy diners. Senior living communities were designed to enhance the quality of life for today’s active seniors — to take away the hassles but leave them with their independence intact. And Sensations Dining does just that. Here’s a meal seniors will look forward to eating – and feel proud to invite their family to share. To find out more about Sensations Dining and Discovery Village living, go to http://www.discoveryvillages.com/dining. And for seniors – or their families – looking for a senior living community to call home, don’t forget about food when you take the grand tour. Take in the general ambiance, check out the activities and ask about transportation – but be sure to ask about the food! If they offer it, be sure to have lunch or dinner in the dining room. What is the atmosphere like? How is the food? Is it hot (or cold) enough? Are there choices? Ask other residents if this meal is typical and how they like the food there. Find out how meals are planned and how they’re prepared. Americans spend an average of 3.66 years of their life eating (and that’s at a rate of only 67 minutes a day – which seems a little on the low side for most of us)! So it’s important to enjoy that time at the table. You deserve it to be sensational. May 6, 2015 in Featured, Senior Living.